Dear Farmhouse, THIS is your future! The first of the permanent renovations is finished! And I couldn’t be more thrilled. I’m working from the top to bottom, front to back so the first room that got the permanent renovation was the back guest bedroom, henceforth known as the Water Room. Before we go too far, I want to address the elephant in the room. Yes, those are vinyl replacement windows. Gasp! I can hear the restoration folks aghast in horror! Hear me out. First, the windows in the 1893 portion and the windows in the 1907 portion (where this bedroom is) did not match. None of them had the original storm windows. Trying to find original wood windows at an architectural salvage place – if I could even find them – would have broken the budget. Second, I never said that this was a restoration. If you revisit the About page, you’ll see that I coined the term renstoration to indicate that the house is being renovated with an eye and reverence to the period aesthetic. Finally, I believe that the builders would have always used the most efficient and most current materials available to them. 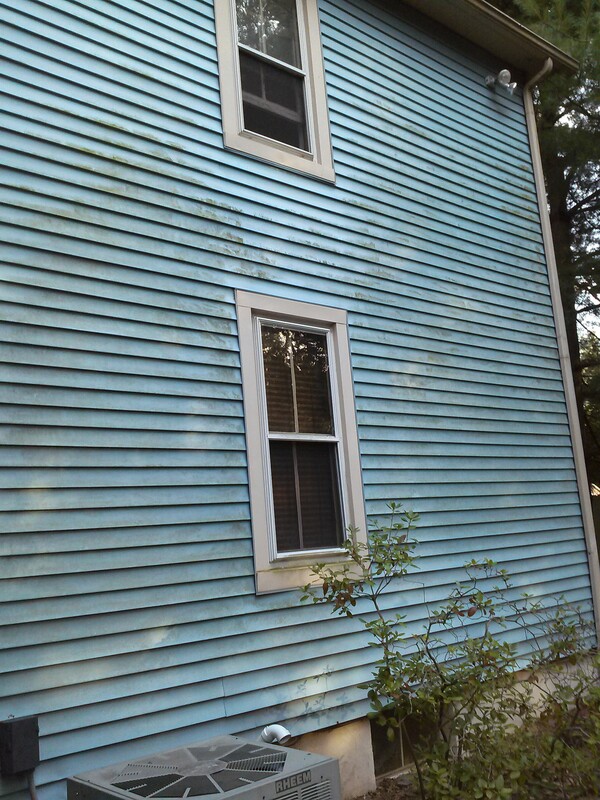 The vinyl replacement windows meet all three of those criteria – value, aesthetic, and efficiency. Perhaps, in the future, I’ll be able to afford wood reproduction windows. Moving on….. The ceilings had that terrible 80s trend of popcorn. I scraped all that off and repainted the ceiling in a bright white. I found, during that process, that at some point in the past (probably during the misguided mid-80s renovation), the three exterior plaster walls were replaced with drywall but the walls did not meet the ceiling. Whoever did the renovation decided to cover the rather large gap with a cheap wood crown molding. I had planned to remove the crown but since the gap was so large, I just replaced the crown with a selection that replicated a plaster molding. Then there were the floors. All of the floors, while in good condition, were painted a dark brown. When I started this project, I tried sanding them and stripping them. In both cases, the paint was so ingrained, that it did not come off. I resigned myself to leaving the painted floor until I could afford to install new floors throughout. Then, in the eleventh hour as the boyfriend and I were planing down the door, we tried the power planer on the floor…. A lot of time and $65 for the sealer and the results are AMAZING! And, finally, I addressed some of the details. The door hinges had obviously been painted over more times that I could even imagine. I stripped them and refinished them in a matte black. The details of the Victorian hinge really pop now. 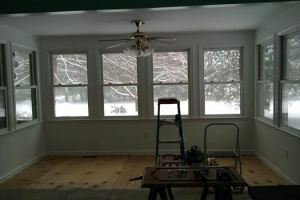 And, because the original window and door casings had been cut in half because of limited space and completely removed on the first floor, I took the opportunity to change the window and door casings to a simple one-by design. I had originally budgeted about $3,500 to complete this room. The biggest expense was the windows which were just over $1,100. Next was the cost to reupholster the chair and ottoman and the cost to remove the construction debris (my township won’t collect construction debris). I am overjoyed with how well this room turned out. It’s pretty much how I envisioned it since I developed the plan in my head. It’s definitely the prettiest room in the house now. 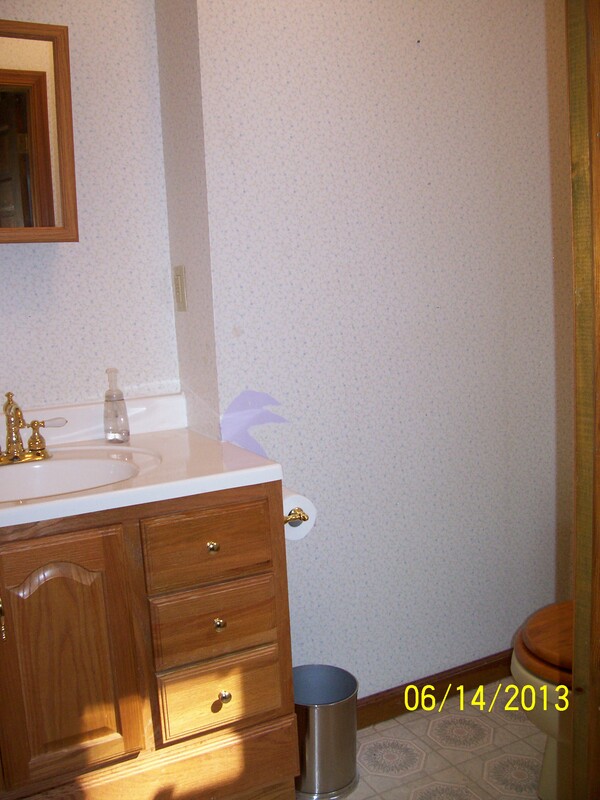 I can’t wait to move on to the next renovation…. As promised, as items get checked off the house to-do list, I’ll share the progress. This one is big! The roof is done! There’s really not much to say about this project since I happily turned the actual work over to professionals. 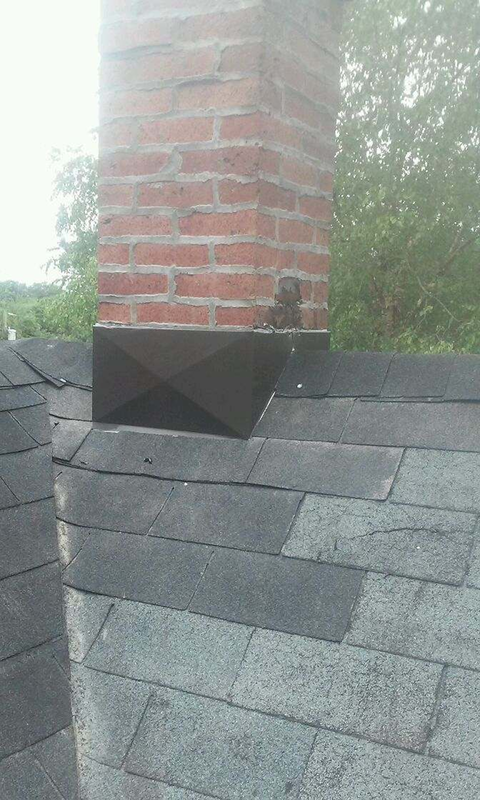 After getting several proposals, I ended up using Emmons Roofing and Siding from Williamstown, NJ. They had a great price and excellent reputation. 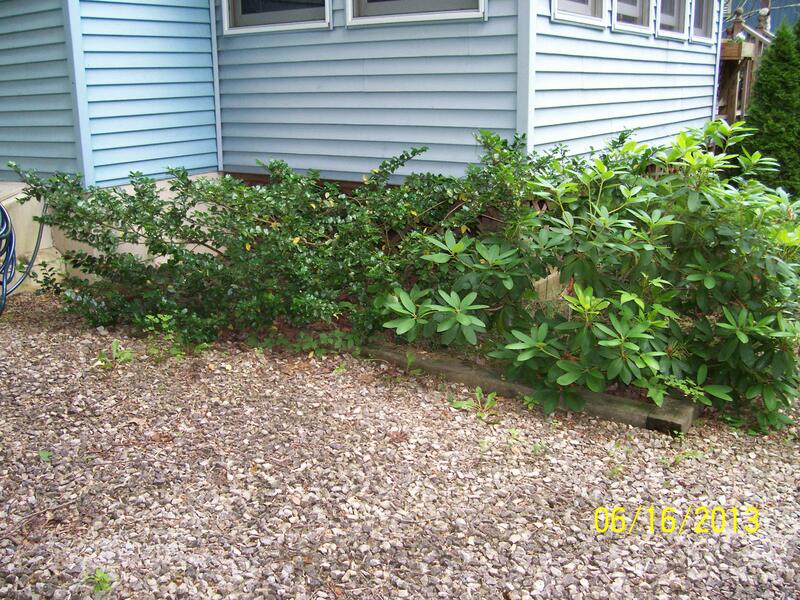 Their work was very professional and the crew was extremely diligent and conscientious with the clean up. 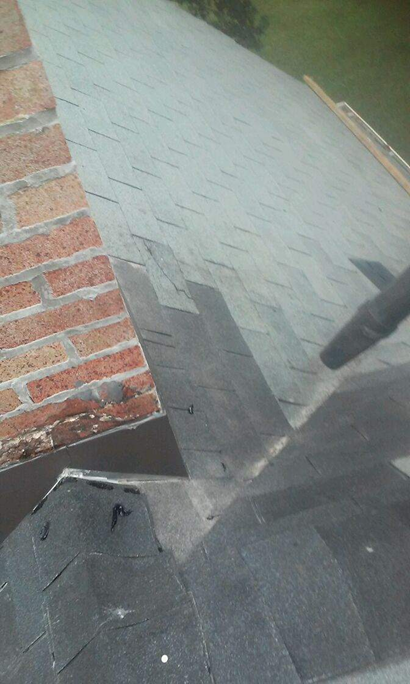 They finished the job over a week ago and I haven’t found a single nail or loose piece of shingle laying around anywhere. I’d highly recommend them to anyone looking to have their roof done. 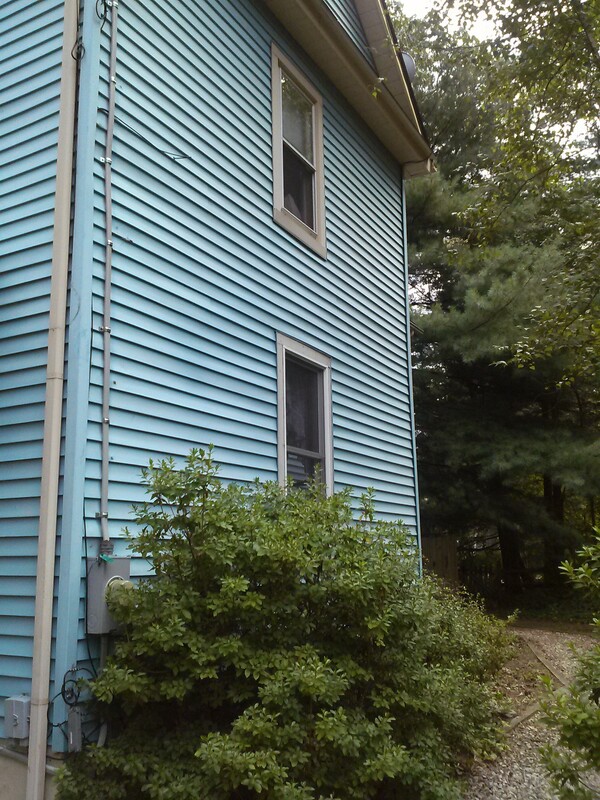 There were 2 sheets of plywood sheathing that needed to be replaced. After 125 years, two sheets ain’t bad! It’s such a relief to have this off “the list.” And, it looks amazing! I’m a very happy homeowner right now! I realized yesterday that this year marks the 125th birthday of my home! It seems sort of fitting for many reasons. The first of which is that this is my 5th year in ownership of the home and property; although I prefer to say that I’m simply the caretaker of the land. Second, after last year’s upheavals, I feel like 2018 in general is going to be a year of renewal and restarts. And, finally, this year will start the renovations that will be included in the final version of Oak Haven Farm as I sense it should be. I want to share what has happened since I last shared progress and what is coming. But, first, I want to share a personal note. As I told you at he end of 2016, my father was diagnosed with brain cancer, a glioblastoma to be precise. Essentially, that diagnosis was terminal. The prognosis for a glioblastoma is 12 to 18 months. Dad survived 12 months and 2 weeks. He passed on June 6, 2017. His treatment stopped working and he went into hospice in January of last year and succumbed six months later. As sad and heart-wrenching as those circumstances were, the family also welcomed a new family member last year. My nephew was born in March. And, we found out that there will be a second little human added to the clan this August. At the end of the year, we all focused on mom. Due to financial constraints, she had to sell their home and moved here to the farm with me. Adjusting to a new place in a different state is difficult and, at her stage in life, I’m sure all the change must be overwhelming. I’m happy to say she’s settling in nicely and getting more and more comfortable with the local roads and stores. And, 2017’s parting gift to me? A diagnosis of discoid lupus! I’m still waiting for a few more tests and appointments which could lead to a systemic lupus diagnosis but for now, we know it’s definitely discoid lupus. I share all this because I wanted you all to know why I haven’t been keeping up with the blog but also because I believe when you talk about things and expose them to the light of day, it takes away their power and gives you control. I will not be defined by these circumstances. I will persist and live my life vibrantly despite them. So, on to more pleasant things…. Way back when I started this blog, I showed you all the hex sign prototype I developed for the farm. I finally got the actual sign painted and installed. My boyfriend gifted me a concrete floor in my garage for the 2016 holidays. Yeah, some girls want jewelry, I was overjoyed with a concrete floor! 😉 It was an amazing surprise to return home to after a business trip. He and his friends did a fabulous job…. I got the white slatwall from a local store that was being demolished. It wasn’t quite dumpster diving, more like dumpster stalking. 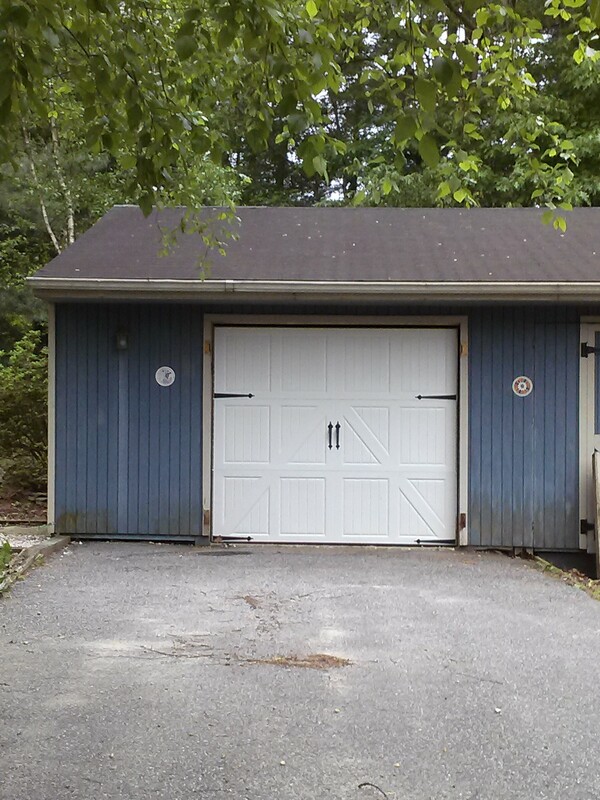 I also finally got the second overhead garage door installed. 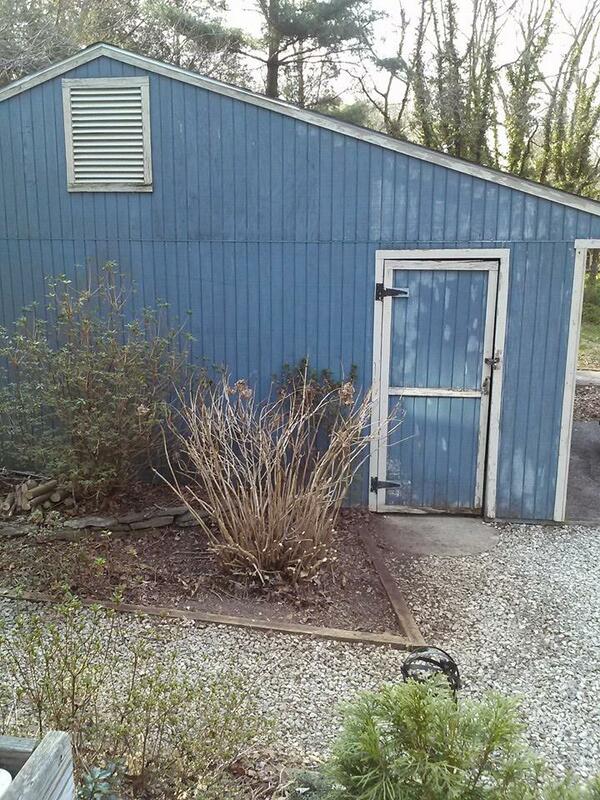 And, the boyfriend created a new opening and built a door for rear access to the garage. I still need to paint it but I ran out of time when temperatures were acceptable. I dug out and installed a paver landing. 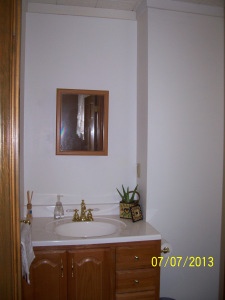 And, I finished the intermediate master bath renovations. I have MUCH bigger plans for the master bath but for now, these updates will keep me somewhat soothed while I’m using that bathroom. And, finally, after some reassessment of my needs and what makes sense, I’ve updated the master plans. Instead of a single two story rear addition, I now feel like a symmetrical second two story rear addition makes more sense. It fits the Folk Victorian aesthetic and it makes for logistical sense to have the laundry and mudroom immediately next to the garage access. The actual work will be a little while down the road but having the plan gives me a direction to head in. 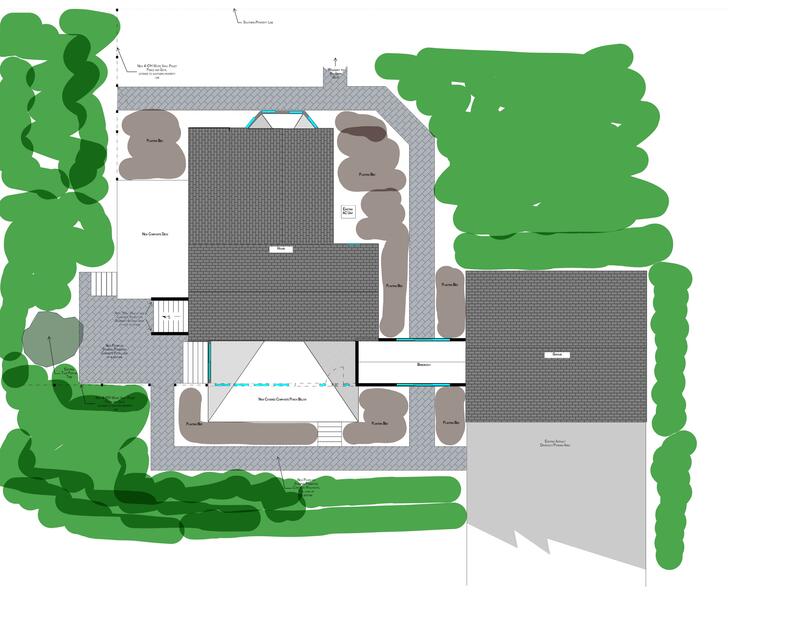 I also tweaked the site plan. Obviously, there’s a lot of work to be done and because I’m not independently wealthy, resources have to be carefully committed. This renstoration is not going to be a sprint; it’s more of a marathon. But, this is my forever home, so taking the time and finances to do things right is important. That brings me to what IS getting done…. I have committed resources – financial and time/effort – to several items on my master plan list this year. I’ll share photos as each is completed. First and foremost, the house is finally getting a new roof! It was past time and I had been nervous the most about this one thing since I moved in. I finally have enough money set aside to be able to get that done. Had we not had the nor’easter move through this past week, it would already be done. Alas, old man winter had other thoughts. That work is rescheduled for Monday now. Second, I started some work in the back bedroom last summer. Mostly scraping popcorn ceiling as a cathartic process after dad passed. But, this year, that room will be completed. Third, I can’t yet afford to renovate the kitchen (besides I have a phasing plan that very specifically maps that work to after the additions get done) but I’m really feeling like I want to put my OCD skills to work in the pantry. I can dress that up and make it an organizer’s dream. Finally, outside, I enlisted the boyfriend to build me a second, matching door for the garage where the existing side swinging door is rotted and falling apart. 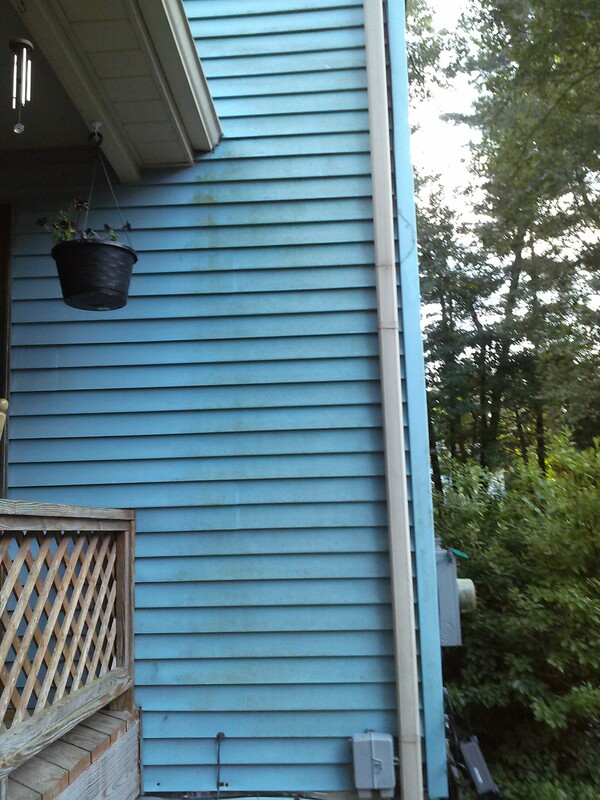 I also need to power wash the house siding again. I invested in a power washer when the deck had to be repaired in 2016. And, while I’m at it, I’m going to try to clean up my existing Bilco doors. I originally planned to remove them completely and create a well (which is shown on the master site plan) but the more I thought about it, the more I realized that the basement doors would be more period and aesthetic appropriate. However, the existing set leak like a sieve in heavy rain. 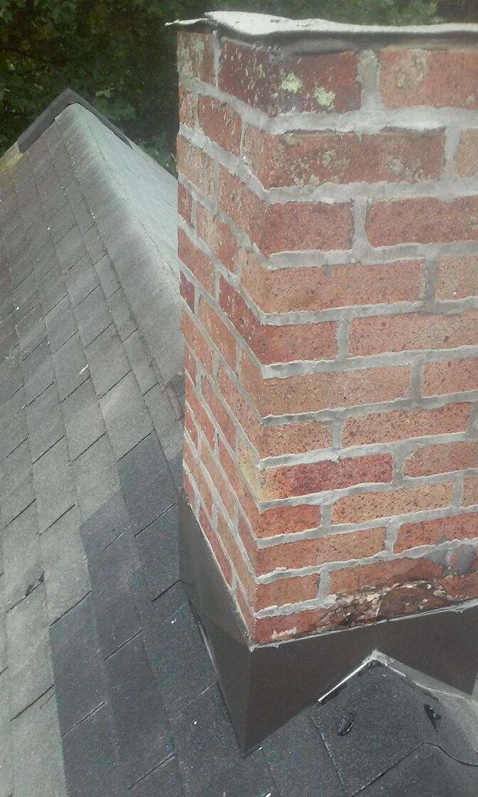 So I need to power wash them, reseal and/or add weatherstripping to them, and check the concrete curb they sit on for cracks, etc. A good coat of black paint then to finish them off. So that’s the plan – for this year and moving forward. I know that I have the right plan because I can literally “see” the updates and rooms now. But, I realize that not everyone can. In the meantime, I thought I’d share my previous handiwork (did the majority of the work myself with the help of the boyfriend and brother) with you all from when I renovated my first house to give you a taste of what’s to come. Enjoy! Once again (there seems to be a pattern here), my renstoration plans were derailed somewhat by a combination of life events and the necessities an old house presents. On a personal note, my dad was diagnosed with brain cancer in May so we were sent scrambling trying to absorb that news and establish a plan for treatment and surviving. I’m happy to report that dad finished his radiation and initial chemo protocol on September 2nd and he’s doing well. That scenario is going to continue to be a day-by-day situation and the family appreciates any and all prayers and good thoughts. 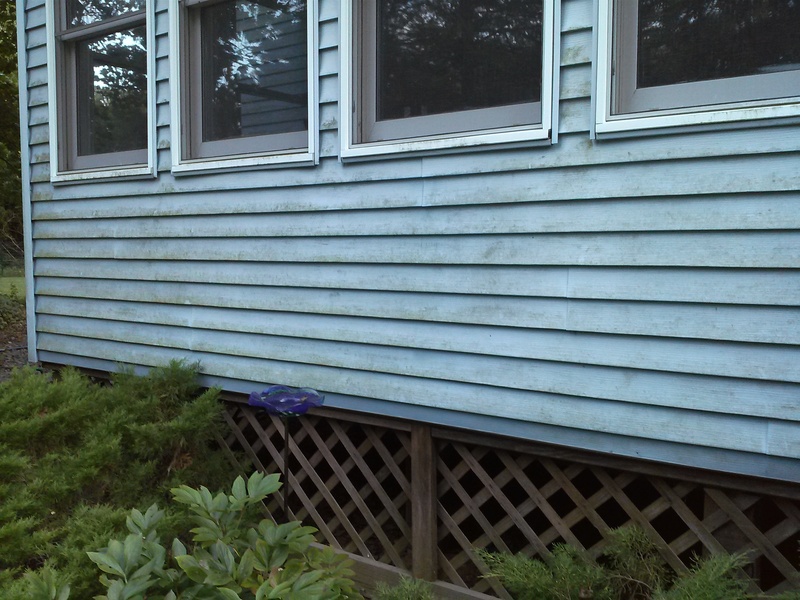 On the house front, the old deck boards started collapsing right in front of the patio door. So, my attention had to be redirected to repairing that. The deck is not part of the permanent master plan but need trumps want sometimes. Since, I was making the repairs on the deck, I decided that I would update the front porch and add in some of the permanent accessories. The first step was to take up the old boards to figure out why they were collapsing. The boyfriend helped with this part! What we discovered was that the joist hangers for the first four joists were completely corroded/rotted away. The good news was that the joists were still in good shape so we could reuse them. The boards were too far gone though so they needed to be replaced along with 8 new joist hangers. Then I gave the whole thing a good cleaning and power wash.
After a good scrub and power wash. While the deck cleaner and power wash made a huge improvement by itself, I decided to paint the deck with Olympic restore because the remaining boards were not in the best condition. I also decided to paint the railing. Here’s the finished product after the paint was completed. 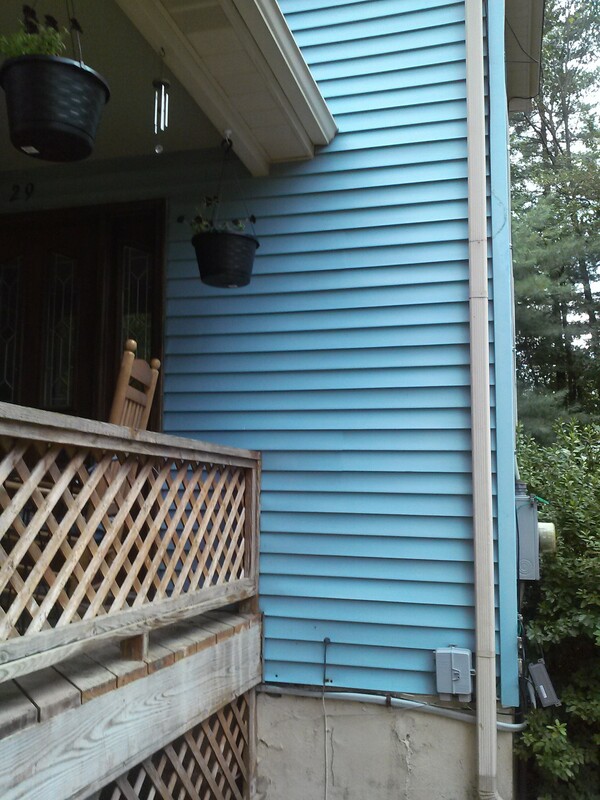 The other changes made as part of the deck project was changing the lights, updating the door trim, replacing the PVC pipe railing with a wood railing, and painting the skirting. I also decided that the adjacent stone patio needed an infusion of love. So I added some of the permanent accessories like a hammock, the new outdoor dining chairs, and the string lights, all of which will remain beyond the temporary fixes. 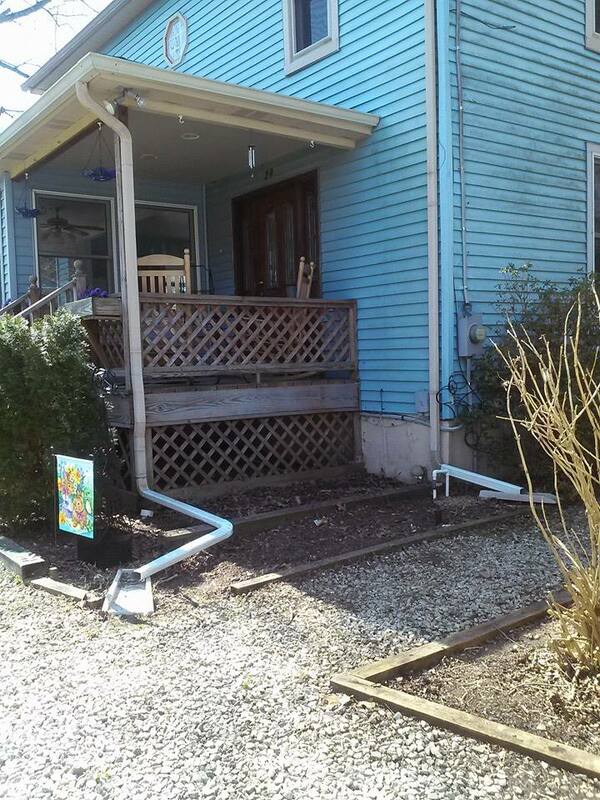 As far as the front porch, the update was fairly basic. I removed the lattice as railing and installed new spindles and then painted the railing and skirting and stained the floor and stair treads. I also added beadboard to the ceiling and changed the lights. All in, that totals $2,180.64 but if I take the permanent items out of the total, I spent $723.30 to update the porch and deck, both of which will be removed during the master renovations. I did most of the labor myself with the help of my boyfriend for the heavy lifting and my brother for the electrical items. I’m still focused on not spending money on items that won’t be part of the final renovations so that’s not too bad considering the deck work was more a necessity than something I wanted to do this year. Without further ado, the finished product…..
As I’ve noted before, I’m trying hard not to spend any unnecessary monies on renovations always keeping my eye on the “master plan.” But, I also want to be comfortable in my home until I have the resources to actually implement the “master plan.” That being said, some (what I’m calling) intermediate updates are occurring. Most of what I did in 2015 included these intermediate updates. I tallied up the receipts and can share what the 2015 aesthetic renovations cost…. My boyfriend, brother, sister-in-law, and I did the labor so the dollar value for labor was $0. All in, that totals just under $4,000 to update four rooms including the kitchen. And, if I take the costs of the appliances out the equation because of their need rather than want, the total comes down to $1,948. Not too bad! 2015 seems to have been a blur! I realize that I haven’t posted here in over a year. It’s not for lack of progress but I just had a really full plate last year. The first third of the year found me, my significant other, brother, and sister-in-law helping mom and dad downsize and get settled into their retirement home. That took my time and resources away from the farm for that duration but the rest of the year was pretty productive. The garden was expanded by one large bed which included prolific eggplant plants, beans, snap peas and sunflowers. The kitchen soffit was expanded so that it follows the cabinetry. Trim was added to make it more aesthetically pleasing. I finally finished painting out the kitchen cabinets. 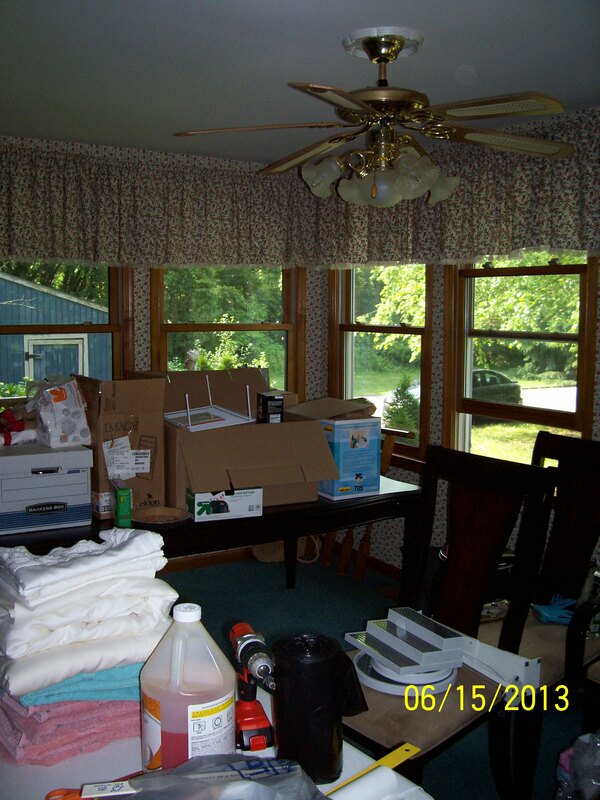 And, the parlor, dining room and kitchen all got a fresh coat of neutral paint. All of the rooms got new light fixtures. 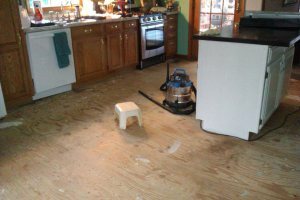 I also installed a floor in the kitchen, dining room and half bath. I ultimately want wood, but for now, a wood-look vinyl plank floor will do. I also removed the concealed spline ceiling and replaced it with drywall in the half bath. The door swing was changed so that the door now swings into the bathroom instead of out into the parlor. The mustard yellow toilet was removed. A piece of inside corner trim was added to the existing 1 x 4 crown to give it a little more character. The light fixture and all the hardware was updated from the dated polished brass to oil rubbed bronze. Then, in the fall this year, I decided to host a Halloween Garden Party and Haunted House (with the help of my brother and sister-in-law who have done one for years). We used the garage as the haunted house by adding black painted plywood partitions to create scenes of horror. These partitions were easily erected and taken down after the party. The porch also got a Halloween ambiance. Unfortunately, also in the fall, the furnace finally gave up its ghost and I had to replace it. At least the late fall was warmer than usual but I know that the icy winds of winter will be approaching soon. Now I’m set! Resignation can be an interesting motivator. Since finalizing the plans for the renstoration, I turned my eye to the financing. Until I can claim my lottery winnings, it seems that I will need to wait until some existing debts – namely the some old school loans and credit card bills – can be paid off before I can endeavor to start the big additions or renovations. It took me 10 years to complete the renovation of my old home (that was a neglected foreclosure when I purchased it). My goal here at the farm is to finish my renstoration in less time than that. The bulk of the aforementioned debt will be paid off in approximately five years and that’s my target date to start the big projects. In the meantime, I’m refocused on tackling the functional aspects of the house. The garage door installed at my anniversary is now automated thanks to my brother and boyfriend. I’ll be able to easily pull the car into the garage in the impending winter weather without getting out of the car to open the door thanks to the newly installed opener. This spring will herald the arrival of the newest toy on the farm…a riding mower. That alone will cut down on the time it takes me to attend to my weekly chores. And, the plan is to also get the furnace replaced because at its age, it could go at any time; and that is certainly not something I could deal well with. The past few months I had to take care of a couple of things that demanded my attention and also took a bite out of my budget for the year. 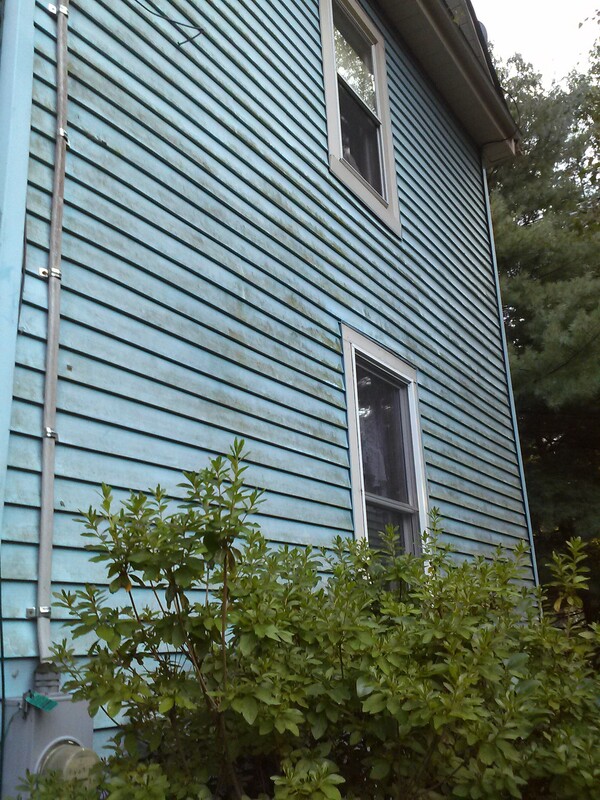 The siding needed to be power-washed as it was covered in algae and maybe even mold. 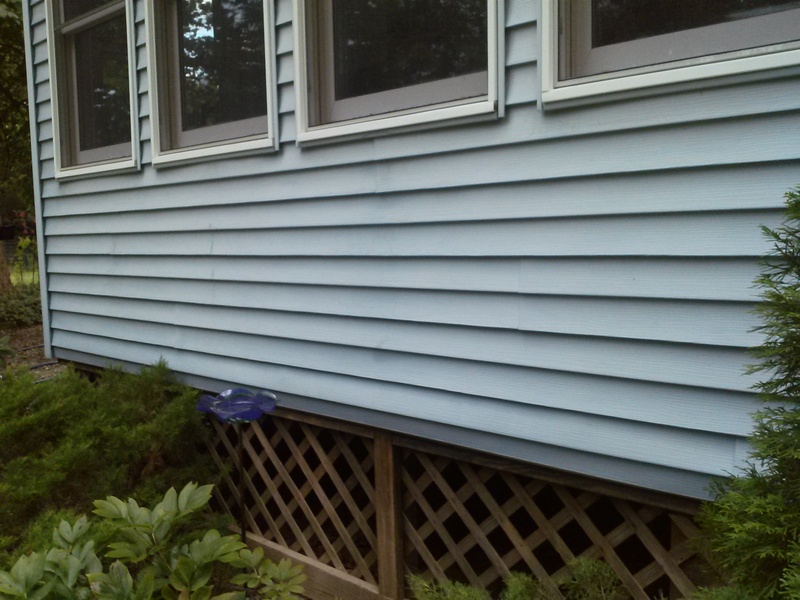 So, while I couldn’t afford new siding, this little fix certainly made it look new. 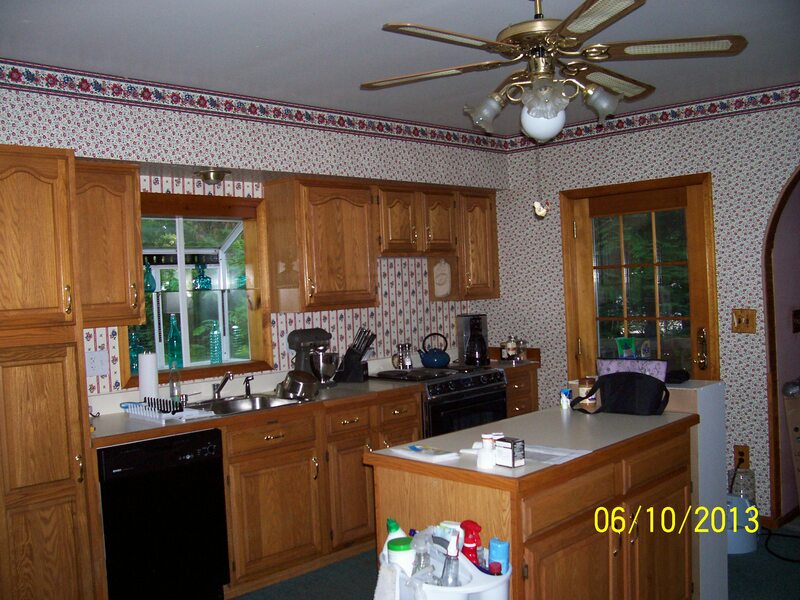 Gentile Painting is excellent; I’ve used them at my old house and will continue to use them here. I highly recommend them. 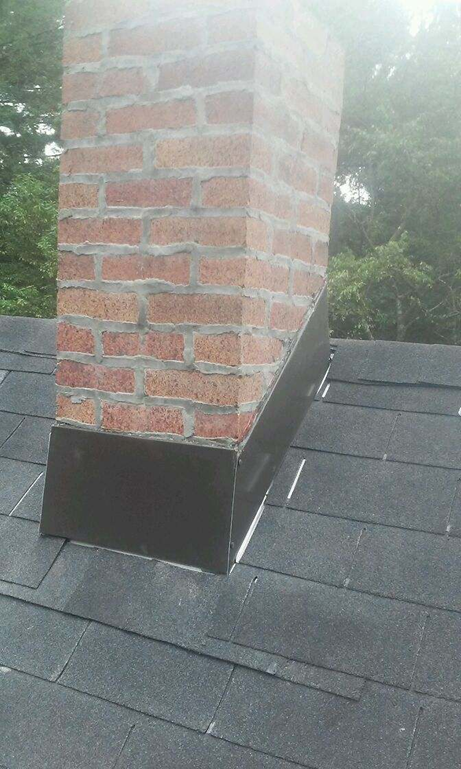 And, the flashing around the chimney – which was a hack job to begin with – final opened up and began leaking. 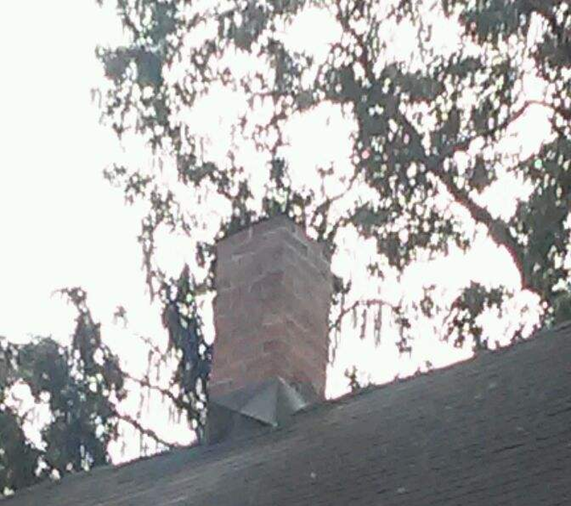 So, I had both chimneys re-flashed properly with break metal and some shingles replaced. The upside is this is now complete for when I redo the roof but it was an unexpected cost that hurt this year. Clarity Contractors of Mays Landing did the nice job. And, I had them give me an estimate on the roof replacement while they were here so now I know how much to budget for that job when the time comes. I rearranged the rec room furniture to make it feel more comfy. I also have some work to do in the kitchen that I want to complete as a temporary update until I can afford the real kitchen remodel. And, with the renstoration plans firmly in place, I can start some of the work ahead of the big renovations like scraping popcorn ceilings and getting rid of the “cake icing” texture on the walls and ceiling in the upstairs hallway. As with most things in my life, having a plan is key. Now, I can start to (slowly) implement that plan. While I can’t provide any real tangible progress on the farm for the past few months, I have been busy with the details of planning the renovation. 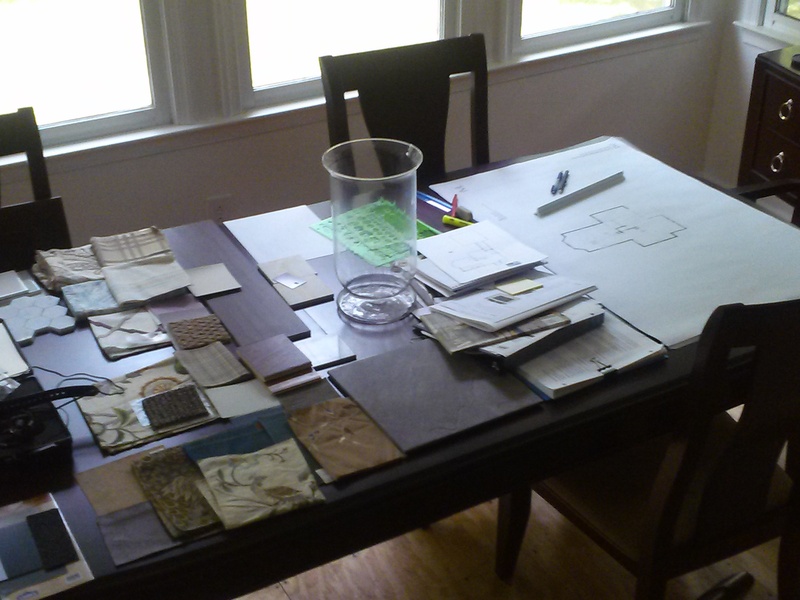 Anyone who has been to my home recently can attest to the fact that my dining table looks more like a designer’s studio than an eating surface…. Current condition of my dining table. Plans, fabric swatches, tile samples…. But, let’s back up a moment and let me explain how I got to where I am. After researching the style of my home, I discovered that it fits the nomenclature of Folk Victorian. That descriptor really doesn’t mean much except that it is a farmhouse that was built during the Victorian era, a period that spanned 1870 to 1910. From what I could find, unlike Victorians that were designed by professional architects for well-to-do citizens, Folk Victorians were usually designed by the same people who built them – the homeowners and/or carpenters. What distinguishes them from any other farmhouse is that they may incorporate some of the elements of the Victorian home that were now being mass manufactured and, more importantly, shipped by train to areas farther away from city centers. Some of these elements could include flat, jig-saw cut, trim or gingerbread on the façade or porch, turned porch spindles, bright colors, and decorative gable-end detailing, as a sampling. Window production had progressed to a point where large panes of glass could be manufactured so the once pandemic multiple-paned windows were no longer used and, instead, one finds two-over-two or one-over-one sashed windows. The Folk Victorian, however, is always a simpler style since these homes were still ultimately built as basic shelter for the common folk. Ironically, Victorian is my least favorite architectural style. I’ve always found the frou-frou too excessive and busy. But, I also feel like a home’s décor should coalesce with the home’s overall style. In my humble opinion, walking into a mid-century modern house with traditional furnishings is an affront to the senses. It makes me uneasy. I want my home to be my sanctuary so I will be incorporating some of the simpler details of the Victorian era to keep the styles consistent. But, mostly, I intend to focus on farmhouse simplicity as that most closely fits my personal style. It will definitely be a balancing act for me. That being said, I’ve spent months refining and then tweaking my plans. Part of my challenge is the orientation of my home on the property. Originally, the rear was the front and vice versa. 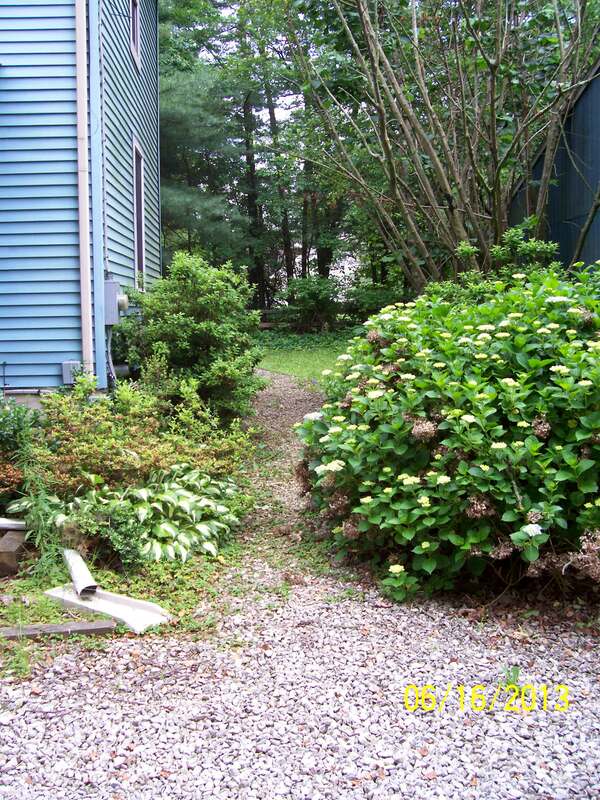 Where the rear deck is now, once stood the original front porch. And, according to the history provided to me by the previous owner, the patio doors were once the location of the front door. What I found I needed, over the past year living here, is a proper foyer and better layout of the half bath, coat closet, laundry facilities, and master suite. With those things in mind, I decided that I am going to enclose the current front porch to create a foyer and add a new front porch across the entire front of the house. 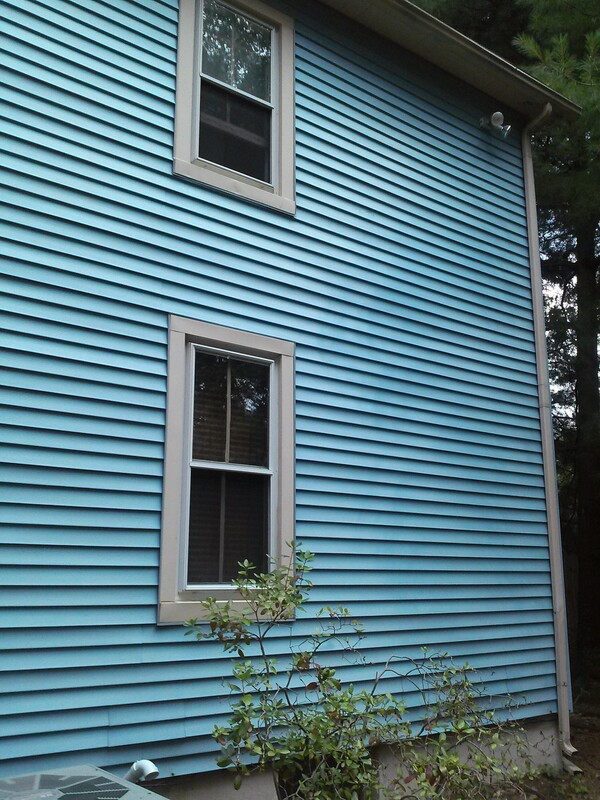 While making that change, I’ll update the roof line over the porch to better identify that as the front of the house. Next, I plan to build an enclosed breezeway between the house and the garage to allow for getting to and from the house in inclement weather. The largest part of the renovation will be the rear addition. 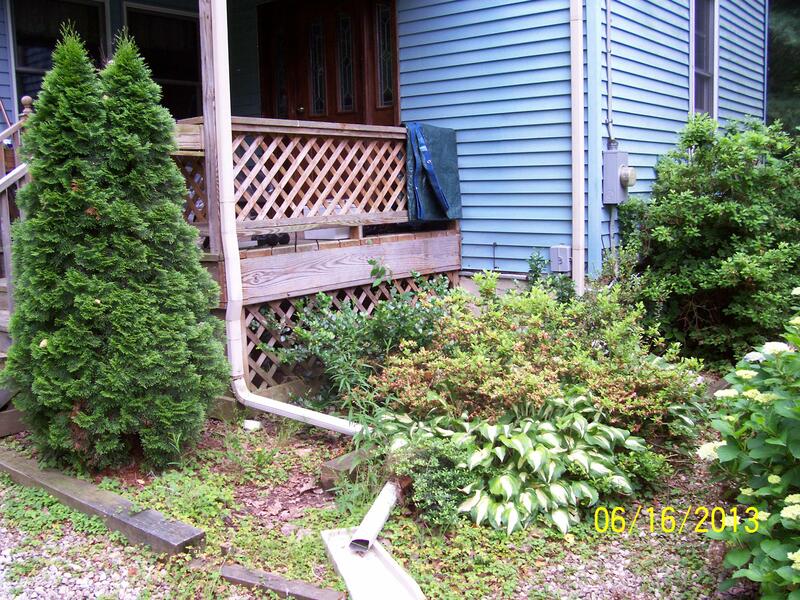 I’m going to demolish the existing deck and build a two story addition in its place. Essentially, the intent is to appear as if I enclosed the original front porch and what could have been a second story sleeping porch (which was commonplace in Victorian era homes). 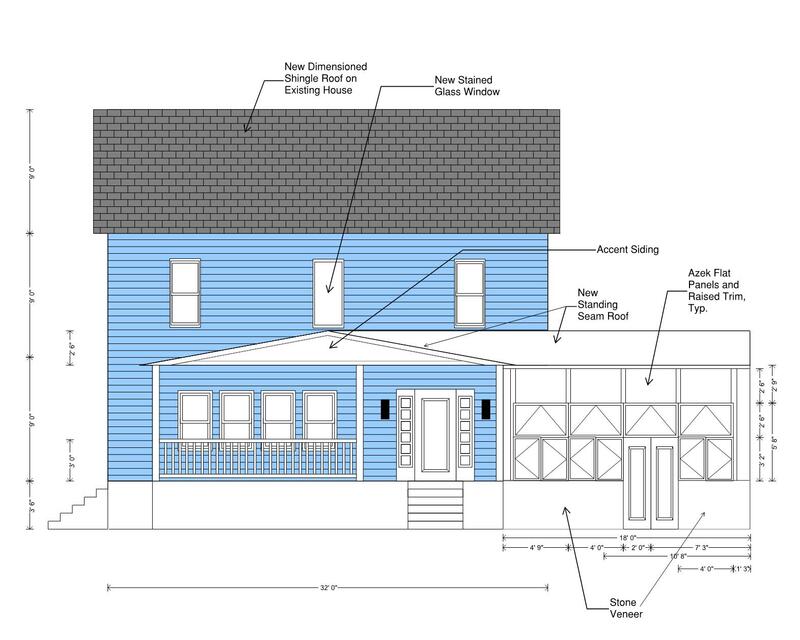 The first floor of this addition will house the relocated half bath and laundry facilities and will be the mudroom from the house to the yard. The second floor of this addition will house the relocated master bathroom – complete with clawfoot tub – and new walk-in closet. A new deck will be built off of the addition. Instead of building a separate home office, I’m going to use the space where the current half bath stands now and create a built-in desk area. Then, the rest of the house is getting an up-to-date facelift. A kitchen renovation is on the plans as is the main bath renovation. New paint, flooring and light fixtures will be installed throughout. All of these changes are being made with an eye and mind to the simplicity and style of a farmhouse built in the Victorian era. Until I can claim my lottery winnings, I am going to have to do this work over several months and years. Part of the planning is phasing out the work. In the meantime, I will be continuing to make the existing home fit my tastes as best as possible without spending unnecessary monies in the process. I’ll keep posting the progress as I go. My last home which was a foreclosure fixer-upper took me ten years to complete. My goal here is to finish in less than that time frame. But, for now, if you’ll excuse me, I need to ruminate over Bedroom 3 fabric swatches and try to find a wood floor that makes me happy! Today marks one year since I made Oak Haven Farm my home. A lot has been done already, although to me it still feels like not enough. Of course, anyone who know me well, knows that I won’t feel like it’s enough until I can complain that I don’t have anything left to do! But here’s a quick flashback on what I have accomplished in the first year here on the farm. Getting the wallpaper (and matching curtains) off the walls was priority number one. I still have to tackle the borders in the master bedroom and small guest bedroom and the wallpaper in the larger guest bedroom but at least the first floor has been de-papered. And, of course, getting the carpet out of the kitchen was a close second. 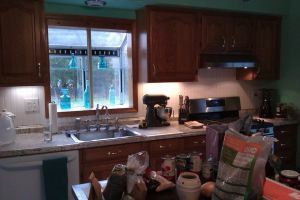 I also started refinishing the cabinets and replaced the countertops. The dishwasher and range both needed to be replaced. Finally, I installed an inexpensive beadboard backsplash and new faucet. A couple of functional aspects were addressed. The furnace was serviced and a new ignitor needed to be installed. The AC unit, which I was told had a bad motor, was also serviced and found to only have an incorrectly installed capacitor; so now I have central air conditioning. 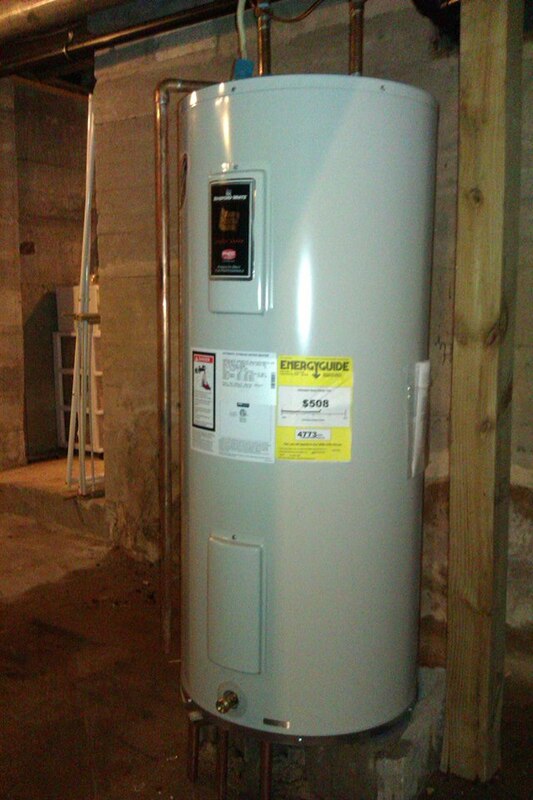 And, the hot water heater sprung a leak and needed to be replaced. With the spring, my focus turned to the outdoors. 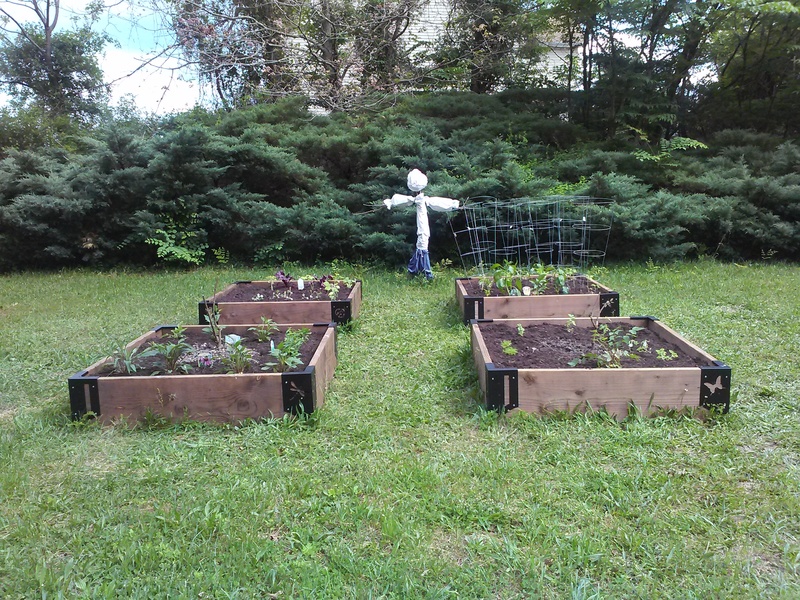 I cleaned up a few planting beds and got in my herb and vegetable garden complete with my Butzemann Hans. And, finally, for our anniversary, I got the house a new garage door. Stay tuned; there’s much more to come! When I bought the farm last May, a small part of my thought process was that there would be enough land/room to build a parents’ suite for my mom and dad. After much conversation and number crunching over the winter months, it doesn’t seem that that is going to be feasible financially or logistically. I’d still like mom and dad to move to Jersey but that’s an entirely different topic for an entirely different blog. Having crossed a parents’ suite addition off the renstoration plans, I was able to fully develop the master plan for the house. 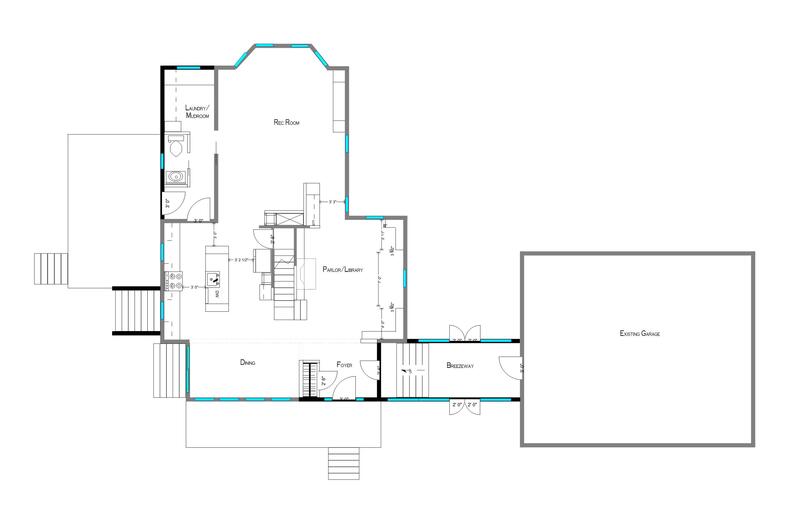 I’m still tweaking the interior layout but here’s the site plan (at least the portion closest to the house). 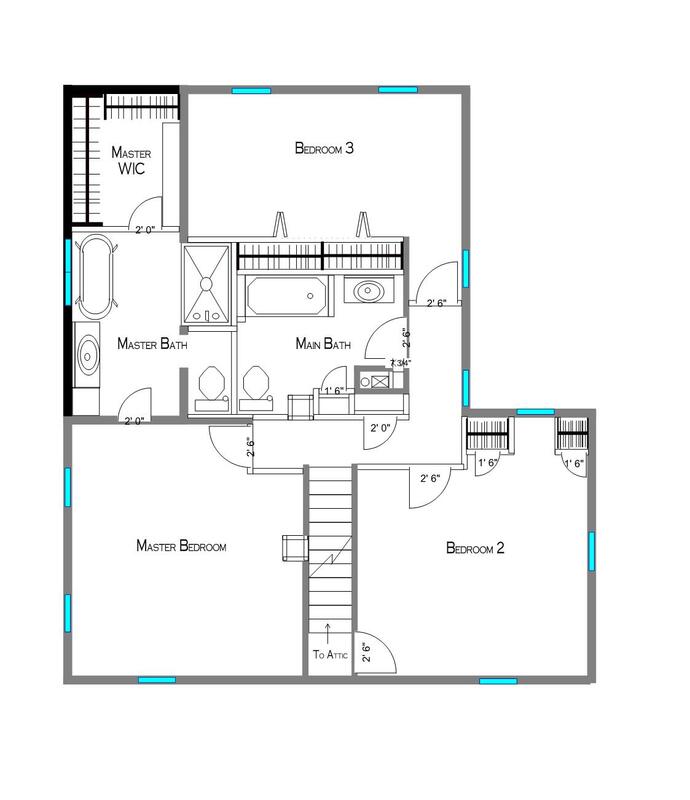 I am going to build a small addition to house the relocated laundry/mudroom and half bath on the first floor and the master bath and walk-in-closet on the second floor. 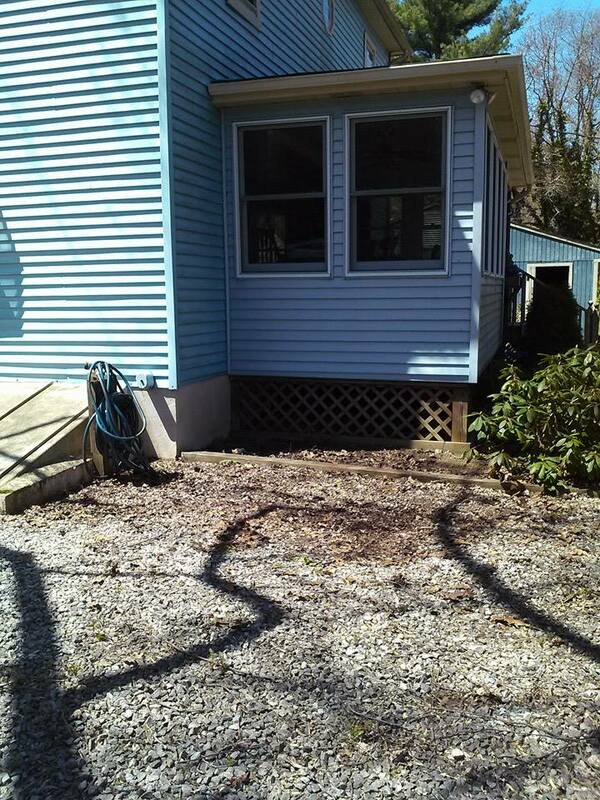 And, I want to enclose the existing front porch to create a proper entry and coat closet. I’ll add a new covered porch across the entire front of the house and a breezeway to connect the house to the garage. Finally, I’m rebuilding a new deck and paver patio and reconstructing the outside basement access.